If you are planning on growing mushrooms at home then you are truly on a noble quest. As an edible fungus their growth requirements are a little different from regular plants but certainly no more challenging. They are virtually fat and calorie-free and packed full of vitamins and minerals, and even an 80g will serve towards your 5-a-day vegetable target. Besides, anyone who is up to the challenge of growing (at least in part) their own food has my respect. For the purpose of this article we shall be looking at that most most popular of all mushrooms - the button mushroom. Now there are two ways in which to pursue this, you can either purchase a pre-spawned mushroom box that you just stick under the stairs or you can start from scratch and buy just the mushroom spawn. Mushroom beds and boxes can be established somewhere out the way such as a cellar or a shed. You can make your own beds or boxes using untreated wood. They can be as long and wide as you like, just make sure that they are 10 inches deep. Button mushrooms can be grown in dark or poorly lit conditions but not in direct sunlight. 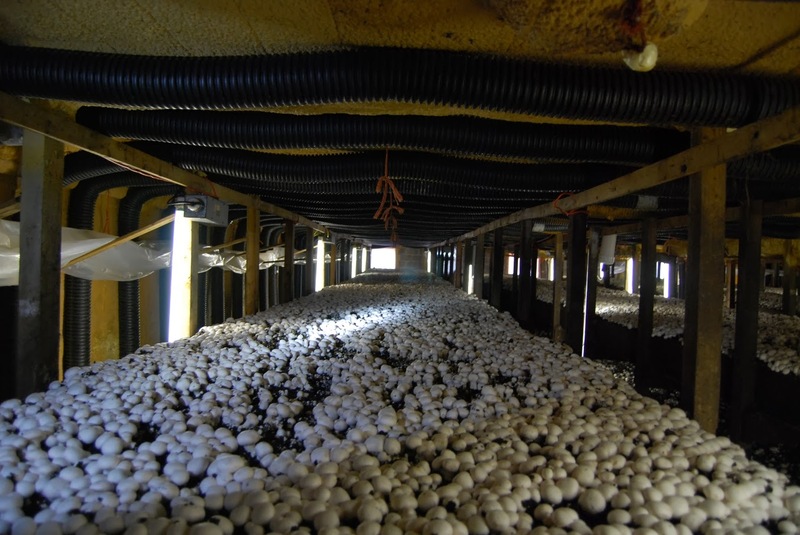 The key to mushroom production is being able to maintain an even temperature of around 16 degrees Celsius to grow. Temperatures can not be allowed to go below 10C or above 20C. Fill the bed with well-rotted horse manure, it should be dark brown and have a mild sweet smell. 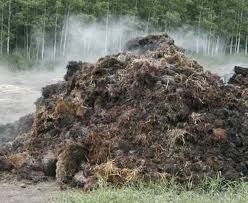 You can purchase well-rotted horse manure, pre-bagged from garden centres. If you are struggling to buy what you need then you can always produce your own. See below to find out how to produce your own. Tightly pack the mushroom beds with the prepared compost and scatter the spawn across the surface. Mix the spawn 2 or 3 inches deep into the compost and the cover it with damp newspaper. After 3 weeks, the compost will be colonised by mycelium (fungal roots) which will look like mat of white threads. The newspaper can be removed at this at this point. Covering the compost with a 1 inch layer made from a mix of 50% garden soil, 50% peat and a few handfuls of lime. This is known as the casing layer. Alternatively you could also use 50% compost (peat-free is fine) and 50% chalk or lime. The lime is necessary as mushrooms prefer to grow in alkaline conditions. Maintain a moist, humid atmosphere as mushrooms develop by keeping the casing layer moist but not wet. To achieve this, water with a fine rose watering can or the mister setting on a hose-gun. The mushrooms will begin to develop 3 to 5 weeks after the casing layer has been added. Button mushrooms are harvested by twisting the cap until it comes away from the compost. You an expect further of growth every 10 days or so. Button mushroom grow best on well-rotted horse manure. To make your own collect regular horse manure from your local stables and fork it into a heap somewhere suitable at home. Moisten the heap with water and pack it down firmly using the back of a shovel. The heap should soon heat up in the middle and become hot to touch. The heap will need to be turned over every 2 days, forking the cooler manure on the outside into the middle. Make sure the manure remains moist but not waterlogged and continue with this forking over process for the next 2 or 3 weeks. You will know when the compost is ready once it has become dark brown and releases a mild sweet smell.